Astelin® Nasal Spray contains 0.1% azelastine hydrochloride in an aqueous solution at pH 6.8 ± 0.3. It also contains benzalkonium chloride (125 mcg/mL), edetate disodium, hypromellose, citric acid, dibasic sodium phosphate, sodium chloride, and purified water. After priming, each metered spray delivers a 0.137 mL mean volume containing 137 mcg of azelastine hydrochloride (equivalent to 125 mcg of azelastine base). The bottle can deliver 200 metered sprays. 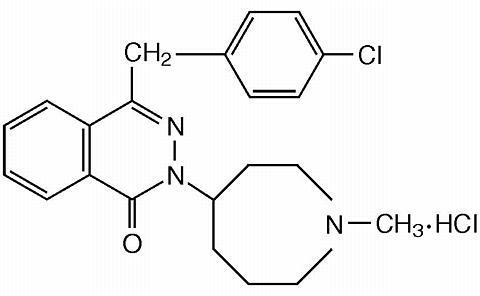 Azelastine hydrochloride, a phthalazinone derivative, exhibits histamine H 1 -receptor antagonist activity in isolated tissues, animal models, and humans. Astelin® Nasal Spray is administered as a racemic mixture with no difference in pharmacologic activity noted between the enantiomers in in vitro studies. The major metabolite, desmethylazelastine, also possesses H 1 -receptor antagonist activity. After intranasal administration, the systemic bioavailability of azelastine hydrochloride is approximately 40%. Maximum plasma concentrations (Cmax) are achieved in 2-3 hours. Based on intravenous and oral administration, the elimination half-life, steady-state volume of distribution, and plasma clearance are 22 hours, 14.5 L/kg, and 0.5 L/h/kg, respectively. Approximately 75% of an oral dose of radiolabeled azelastine hydrochloride was excreted in the feces with less than 10% as unchanged azelastine. Azelastine is oxidatively metabolized to the principal active metabolite, desmethylazelastine, by the cytochrome P450 enzyme system. The specific P450 isoforms responsible for the biotransformation of azelastine have not been identified; however, clinical interaction studies with the known CYP3A4 inhibitor erythromycin failed to demonstrate a pharmacokinetic interaction. In a multiple-dose, steady-state drug interaction study in normal volunteers, cimetidine (400 mg twice daily), a nonspecific P450 inhibitor, raised orally administered mean azelastine (4 mg twice daily) concentrations by approximately 65%. The major active metabolite, desmethylazelastine, was not measurable (below assay limits) after single-dose intranasal administration of azelastine hydrochloride. After intranasal dosing of azelastine hydrochloride to steady-state, plasma concentrations of desmethylazelastine range from 20-50% of azelastine concentrations. When azelastine hydrochloride is administered orally, desmethylazelastine has an elimination half-life of 54 hours. Limited data indicate that the metabolite profile is similar when azelastine hydrochloride is administered via the intranasal or oral route. In vitro studies with human plasma indicate that the plasma protein binding of azelastine and desmethylazelastine are approximately 88% and 97%, respectively. Azelastine hydrochloride administered intranasally at doses above two sprays per nostril twice daily for 29 days resulted in greater than proportional increases in Cmax and area under the curve (AUC) for azelastine. Studies in healthy subjects administered oral doses of azelastine hydrochloride demonstrated linear responses in Cmax and AUC. Following oral administration, pharmacokinetic parameters were not influenced by age, gender, or hepatic impairment. Based on oral, single-dose studies, renal insufficiency (creatinine clearance <50 mL/min) resulted in a 70-75% higher Cmax and AUC compared to normal subjects. Time to maximum concentration was unchanged. Oral azelastine has been safely administered to over 1400 asthmatic subjects, supporting the safety of administering Astelin® Nasal Spray to allergic rhinitis patients with asthma. In a placebo-controlled study (95 subjects with allergic rhinitis), there was no evidence of an effect of Astelin® Nasal Spray (2 sprays per nostril twice daily for 56 days) on cardiac repolarization as represented by the corrected QT interval (QTc) of the electrocardiogram. At higher oral exposures (>/=4 mg twice daily), a nonclinically significant mean change on the QTc (3-7 millisecond increase) was observed. Interaction studies investigating the cardiac repolarization effects of concomitantly administered oral azelastine hydrochloride and erythromycin or ketoconazole were conducted. Oral erythromycin had no effect on azelastine pharmacokinetics or QTc based on analysis of serial electrocardiograms. Ketoconazole interfered with the measurement of azelastine plasma levels; however, no effects on QTc were observed (see PRECAUTIONS , Drug Interactions ). U.S. placebo-controlled clinical trials of Astelin® Nasal Spray included 322 patients with seasonal allergic rhinitis who received two sprays per nostril twice a day for up to 4 weeks. These trials included 55 pediatric patients ages 12 to 16 years. Astelin® Nasal Spray significantly improved a complex of symptoms, which included rhinorrhea, sneezing, and nasal pruritus. In dose-ranging trials, Astelin® Nasal Spray administration resulted in a decrease in symptoms, which reached statistical significance from saline placebo within 3 hours after initial dosing and persisted over the 12-hour dosing interval. There were no findings on nasal examination in an 8-week study that suggested any adverse effect of azelastine on the nasal mucosa. Two hundred sixteen patients with vasomotor rhinitis received Astelin® Nasal Spray two sprays per nostril twice a day in two U.S. placebo controlled trials. These patients had vasomotor rhinitis for at least one year, negative skin tests to indoor and outdoor aeroallergens, negative nasal smears for eosinophils, and negative sinus X-rays, Astelin® Nasal Spray significantly improved a symptom complex comprised of rhinorrhea, post nasal drip, nasal congestion, and sneezing. Astelin® Nasal Spray is indicated for the treatment of the symptoms of seasonal allergic rhinitis such as rhinorrhea, sneezing, and nasal pruritus in adults and children 5 years and older, and for the treatment of the symptoms of vasomotor rhinitis, such as rhinorrhea, nasal congestion and postnasal drip in adults and children 12 years and older. Astelin® Nasal Spray is contraindicated in patients with a known hypersensitivity to azelastine hydrochloride or any of its components. Activities Requiring Mental Alertness: In clinical trials, the occurrence of somnolence has been reported in some patients taking Astelin® Nasal Spray; due caution should therefore be exercised when driving a car or operating potentially dangerous machinery. Concurrent use of Astelin® Nasal Spray with alcohol or other CNS depressants should be avoided because additional reductions in alertness and additional impairment of CNS performance may occur. Information for Patients: Patients should be instructed to use Astelin® Nasal Spray only as prescribed. For the proper use of the nasal spray and to attain maximum improvement, the patient should read and follow carefully the accompanying patient instructions. Patients should be instructed to prime the delivery system before initial use and after storage for 3 or more days (see PATIENT INSTRUCTIONS FOR USE). Patients should also be instructed to store the bottle upright at room temperature with the pump tightly closed and out of the reach of children. In case of accidental ingestion by a young child, seek professional assistance or contact a poison control center immediately. Patients should be advised against the concurrent use of Astelin® Nasal Spray with other antihistamines without consulting a physician. Patients who are, or may become, pregnant should be told that this product should be used in pregnancy or during lactation only if the potential benefit justifies the potential risks to the fetus or nursing infant. Patients should be advised to assess their individual responses to Astelin® Nasal Spray before engaging in any activity requiring mental alertness, such as driving a car or operating machinery. Patients should be advised that the concurrent use of Astelin® Nasal Spray with alcohol or other CNS depressants may lead to additional reductions in alertness and impairment of CNS performance and should be avoided (see Drug Interactions ). Drug Interactions: Concurrent use of Astelin® Nasal Spray with alcohol or other CNS depressants should be avoided because additional reductions in alertness and additional impairment of CNS performance may occur. Cimetidine (400 mg twice daily) increased the mean Cmax and AUC of orally administered azelastine hydrochloride (4 mg twice daily) by approximately 65%. Ranitidine hydrochloride (150 mg twice daily) had no effect on azelastine pharmacokinetics. Interaction studies investigating the cardiac effects, as measured by the corrected QT interval (QTc), of concomitantly administered oral azelastine hydrochloride and erythromycin or ketoconazole were conducted. Oral erythromycin (500 mg three times daily for seven days) had no effect on azelastine pharmacokinetics or QTc based on analyses of serial electrocardiograms. Ketoconazole (200 mg twice daily for seven days) interfered with the measurement of azelastine plasma concentrations; however, no effects on QTc were observed. Carcinogenesis, Mutagenesis, Impairment of Fertility: In 2 year carcinogenicity studies in rats and mice azelastine hydrochloride did not show evidence of carcinogenicity at oral doses up to 30 mg/kg and 25 mg/kg, respectively (approximately 240 and 100 times the maximum recommended daily intranasal dose in adults and children on a mg/m 2 basis). Reproduction and fertility studies in rats showed no effects on male or female fertility at oral doses up to 30 mg/kg (approximately 240 times the maximum recommended daily intranasal dose in adults on a mg/m 2 basis). At 68.6 mg/kg (approximately 560 times the maximum recommended daily intranasal dose in adults on a mg/m 2 basis), the duration of estrous cycles was prolonged and copulatory activity and the number of pregnancies were decreased. The numbers of corpora lutea and implantations were decreased; however, pre-implantation loss was not increased. Pregnancy Category C: Azelastine hydrochloride has been shown to cause developmental toxicity. Treatment of mice with an oral dose of 68.6 mg/kg (approximately 280 times the maximum recommended daily intranasal dose in adults on a mg/m 2 basis) caused embryo-fetal death, malformations (cleft palate; short or absent tail; fused, absent or branched ribs), delayed ossification and decreased fetal weight. This dose also caused maternal toxicity as evidenced by decreased body weight. Neither fetal nor maternal effects occurred at a dose of 3 mg/kg (approximately 10 times the maximum recommended daily intranasal dose in adults on a mg/m 2 basis). In rats, an oral dose of 30 mg/kg (approximately 240 times the maximum recommended daily intranasal dose in adults on a mg/m 2 basis) caused malformations (oligo-and brachydactylia), delayed ossification and skeletal variations, in the absence of maternal toxicity. At 68.6 mg/kg (approximately 560 times the maximum recommended daily intranasal dose in adults on a mg/m 2 basis) azelastine hydrochloride also caused embryo-fetal death and decreased fetal weight; however, the 68.6 mg/kg dose caused severe maternal toxicity. Neither fetal nor maternal effects occurred at a dose of 3 mg/kg (approximately 25 times the maximum recommended daily intranasal dose in adults on a mg/m 2 basis). In rabbits, oral doses of 30 mg/kg and greater (approximately 500 times the maximum recommended daily intranasal dose in adults on a mg/m 2 basis) caused abortion, delayed ossification and decreased fetal weight; however, these doses also resulted in severe maternal toxicity. Neither fetal nor maternal effects occurred at a dose of 0.3 mg/kg (approximately 5 times the maximum recommended daily intranasal dose in adults on a mg/m 2 basis). There are no adequate and well-controlled clinical studies in pregnant women. Astelin® Nasal Spray should be used during pregnancy only if the potential benefit justifies the potential risk to the fetus. Nursing Mothers: It is not known whether azelastine hydrochloride is excreted in human milk. Because many drugs are excreted in human milk, caution should be exercised when Astelin® Nasal Spray is administered to a nursing woman. Pediatric Use: The safety and effectiveness of Astelin® Nasal Spray at a dose of 1 spray per nostril twice daily has been established for patients 5 through 11 years of age for the treatment of symptoms of seasonal allergic rhinitis. The safety of this dosage of Astelin® Nasal Spray was established in well-controlled studies of this dose in 176 patients 5 to 12 years of age treated for up to 6 weeks. The efficacy of Astelin® Nasal Spray at this dose is based on an extrapolation of the finding of efficacy in adults, on the likelihood that the disease course, pathophysiology and response to treatment are substantially similar in children compared to adults, and on supportive data from controlled clinical trials in patients 5 to 12 years of age at the dose of 1 spray per nostril twice daily. The safety and effectiveness of Astelin® Nasal Spray in patients below the age of 5 years have not been established. Geriatric Use: Clinical studies of Astelin® Nasal Spray did not include sufficient numbers of subjects aged 65 and over to determine whether they respond differently from younger subjects. Other reported clinical experience has not identified differences in responses between the elderly and younger patients. In general, dose selection for an elderly patient should be cautious, usually starting at the low end of the dosing range, reflecting the greater frequency of decreased hepatic, renal, or cardiac function, and of concomitant disease or other drug therapy. Adverse experience information for Astelin® Nasal Spray is derived from six well-controlled, 2-day to 8-week clinical studies which included 391 patients who received Astelin® Nasal Spray at a dose of 2 sprays per nostril twice daily. In placebo-controlled efficacy trials, the incidence of discontinuation due to adverse reactions in patients receiving Astelin® Nasal Spray was not significantly different from vehicle placebo (2.2% vs 2.8%, respectively). In these clinical studies, adverse events that occurred statistically significantly more often in patients treated with Astelin® Nasal Spray versus vehicle placebo included bitter taste (19.7% vs 0.6%), somnolence (11.5% vs 5.4%), weight increase (2.0% vs 0%), and myalgia (1.5% vs 0%). The following adverse events were reported with frequencies >/=2% in the Astelin® Nasal Spray treatment group and more frequently than placebo in short-term (</=2 days) and long-term (2-8 weeks) clinical trials. A total of 176 patients 5 to 12 years of age were exposed to Astelin® Nasal Spray at a dose of 1 spray each nostril twice daily in 3 placebo-controlled studies. In these studies, adverse events that occurred more frequently in patients treated with Astelin® Nasal Spray than with placebo, and that were not represented in the adult adverse event table above include rhinitis/cold symptoms (17.0% vs 9.5%), cough (11.4% vs 8.3%), conjunctivitis (5.1% vs 1.8%), and asthma (4.5% vs 4.1%). The following events were observed infrequently (<2% and exceeding placebo incidence) in patients who received Astelin® Nasal Spray (2 sprays/nostril twice daily) in U.S. clinical trials. Dermatological: contact dermatitis, eczema, hair and follicle infection, furunculosis. Digestive: constipation, gastroenteritis, glossitis, ulcerative stomatitis, vomiting, increased SGPT, aphthous stomatitis. Metabolic and Nutritional: increased appetite. Psychological: anxiety, depersonalization, depression, nervousness, sleep disorder, thinking abnormal. Respiratory: bronchospasm, coughing, throat burning, laryngitis. Special Senses: conjunctivitis, eye abnormality, eye pain, watery eyes, taste loss. Urogenital: albuminuria, amenorrhea, breast pain, hematuria, increased urinary frequency. Whole Body: allergic reaction, back pain, herpes simplex, viral infection, malaise, pain in extremities, abdominal pain. Adverse experience information for Astelin® Nasal Spray is derived from two placebo-controlled clinical studies which included 216 patients who received Astelin® Nasal Spray at a dose of 2 sprays per nostril twice daily for up to 28 days. The incidence of discontinuation due to adverse reactions in patients receiving Astelin® Nasal Spray was not different from vehicle placebo (2.8% vs 2.9%, respectively). The following adverse events were reported with frequencies >/=2% in the Astelin® Nasal Spray treatment group and more frequently than placebo. Events observed infrequently (<2% and exceeding placebo incidence) in patients who received Astelin® Nasal Spray (2 sprays/nostril twice daily) in U.S. clinical trials in vasomotor rhinitis were similar to those observed in U.S. clinical trials in seasonal allergic rhinitis. In controlled trials involving nasal and oral azelastine hydrochloride formulations, there were infrequent occurrences of hepatic transaminase elevations. The clinical relevance of these reports has not been established. In addition, the following spontaneous adverse events have been reported during the marketing of Astelin® Nasal Spray and causal relationship with the drug is unknown: anaphylactoid reaction, application site irritation, chest pain, nasal congestion, confusion, diarrhea, dyspnea, facial edema, involuntary muscle contractions, paresthesia, parosmia, pruritus, rash, tolerance, urinary retention, vision abnormal and xerophthalmia. There have been no reported overdosages with Astelin® Nasal Spray. Acute overdosage by adults with this dosage form is unlikely to result in clinically significant adverse events, other than increased somnolence, since one bottle of Astelin® Nasal Spray contains 30 mg of azelastine hydrochloride. Clinical studies in adults with single doses of the oral formulation of azelastine hydrochloride (up to 16 mg) have not resulted in increased incidence of serious adverse events. General supportive measures should be employed if overdosage occurs. There is no known antidote to Astelin® Nasal Spray. Oral ingestion of antihistamines has the potential to cause serious adverse effects in young children. Accordingly, Astelin® Nasal Spray should be kept out of the reach of children. Oral doses of 120 mg/kg and greater (approximately 460 times the maximum recommended daily intranasal dose in adults and children on a mg/m 2 basis) were lethal in mice. Responses seen prior to death were tremor, convulsions, decreased muscle tone, and salivation. In dogs, single oral doses as high as 10 mg/kg (approximately 260 times the maximum recommended daily intranasal dose in adults and children on a mg/m 2 basis) were well tolerated, but single oral doses of 20 mg/kg were lethal. The recommended dose of Astelin® Nasal Spray in adults and children 12 years and older with seasonal allergic rhinitis is two sprays per nostril twice daily. The recommended dose of Astelin® Nasal Spray in children 5 years to 11 years of age is one spray per nostril twice daily. The recommended dose of Astelin® Nasal Spray in adults and children 12 years and older with vasomotor rhinitis is two sprays per nostril twice daily. Before initial use, the screw cap on the bottle should be replaced with the pump unit and the delivery system should be primed with 4 sprays or until a fine mist appears. When 3 or more days have elapsed since the last use, the pump should be reprimed with 2 sprays or until a fine mist appears. CAUTION: Avoid spraying in the eyes. Directions for Use: Illustrated patient instructions for proper use accompany each package of Astelin® Nasal Spray. Astelin® (azelastine hydrochloride) Nasal Spray, 137 mcg, (NDC 0037-0241-30) is supplied as a package containing 200 metered sprays in a high-density polyethylene (HDPE) bottle fitted with a metered-dose spray pump unit. A leaflet of patient instructions is also provided. The spray pump unit consists of a nasal spray pump fitted with a blue safety clip and a blue plastic dust cover. The Astelin® (azelastine hydrochloride) Nasal Spray, 137 mcg, bottle contains 30 mg (1 mg/mL) of azelastine hydrochloride. The bottle can deliver 200 metered sprays. Each spray delivers a mean of 0.137 mL solution containing 137 mcg of azelastine hydrochloride. Storage: Store at controlled room temperature 20°-25°C (68°-77°F). Protect from freezing. © 2003 Medpointe Healthcare Inc.